Acne, or acne vulgaris, is common, frustrating, and can impact how you look at yourself, especially in the mirror. As the most common skin condition in the US, the American Academy of Dermotology estimates 50 million people suffer acne each year. While upwards of 85% of people have acne at some point in their lives, it doesn't make the condition any easier, or less personal. While the costs of treating acne each year are more than $3 billion, that doesn't include the enormous costs paid by people who try pricey "natural" acne treatment systems, home concoctions, or questionable remedies suggested by friends—anything to make the zits go away. Recent research, presented at the Microbiology Society's Annual Conference by a team from the David Geffen School of Medicine in UCLA, may open doors for new options in the treatment of acne. Despite the variety of treatments available to those who suffer acne, most topical remedies treat the symptoms, like the skin lesions, and leave dry skin as a result. Broad spectrum antibiotics are a longtime go-to treatment of acne. Acne has several triggers, including hormones, stress, fatigue, medications, and genetics. Those triggers increase production of sebum in hair follicles, which is the equivalent of creating a full-time buffet for P. acnes. Rather than push away from the table, the bacteria overproduce to take advantage of the food supply, among other things. The resulting backup of bacteria, oil, and other stuff clogs pores and keeps oil from emptying onto the surface of the skin, causing what we call acne. 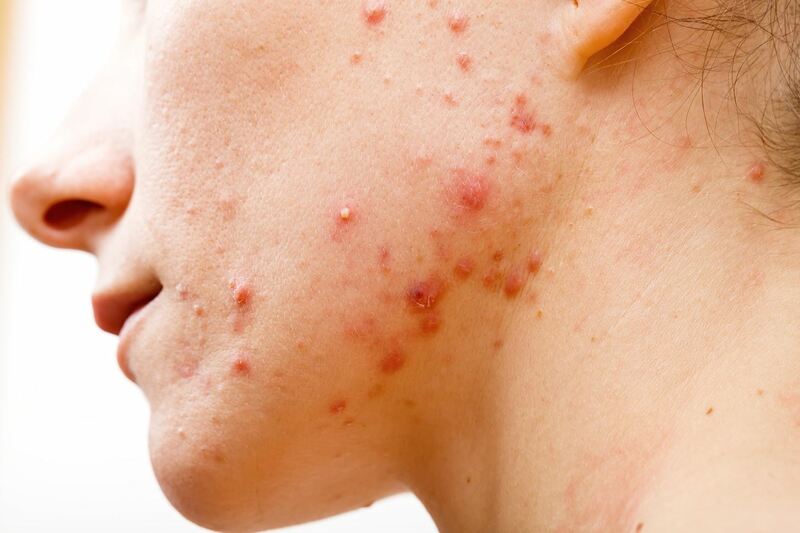 Antibiotics prescribed for acne reduce the bacteria population, but cannot remedy the underlying cause of the condition. Along the way, antibiotics indiscriminately kill important beneficial bacteria throughout the body and contribute to the problem of drug-resistant bacteria. The UCLA group took a different approach altogether. By using pore cleansing strips available over the counter, scientists took samples from 38 healthy young adults with acne, and 30 without acne. Researchers also sampled follicles from four adults ages 55 through 79. Using metagenomic shotgun sequencing, the team identified the players present in the community of bacteria on each participant's face, or skin microbiome. Metagenomic shotgun sequencing is a process that allows researchers to have a look at the diversity of microorganisms present in an environment, in this case, the human skin. By using the shotgun (broad) approach, scientists could analyze DNA samples that could otherwise be impossible to study. For good and forever, P. acnes: The bacteria commonly blamed for acne are present in the skin microbiome of those with and without acne. But the strains of P. acnes were different between the two groups. In the group without acne, the P. acnes strains support bacterial metabolism, and are considered important for healthy skin. In the group of participants with acne, there were less helpful strains of P. acnes that were more likely to trigger skin damage. Age, the ultimate cure: The skin microbiome of participants over age 50 was similar to those of younger participants without acne. As the authors note, acne rarely occurs in adults over age 50. Friends and neighbors: P. acnes and its relative Propionibacterium granulosum are important members of a healthy skin microbiome. Study authors note the abundance of these bacteria in healthy individuals "suggest a role for these species in skin health." These bacteria produce a secretion that has antimicrobial properties and helps maintain an acidic skin pH. The acidic pH, just like the skin of the scalp, helps defend the skin against pathogens. Study authors suggest development of focused treatments "that can target specific helpful (and non-helpful) P. acnes strains and thus shift the strain (or type of bacteria) composition to a healthy skin microbiota." Far from a one tube of benzoyl peroxide fits all condition, the research notes "acne is a disease with a wide spectrum of severity and that the skin microbiome is reflective of this large variation." The study finds acne is a result of a "disrupted balance in the . . . microbiota" that contributes to disease severity, rather than attributing the condition to one harmful microorganism that actually has a pretty important role in keeping skin healthy. Understanding the bacterial community on the skin is important for the development of personalised treatments in acne. Instead of killing all bacteria, including the beneficial ones, we should focus on shifting the balance toward a healthy microbiota by targeting harmful bacteria or enriching beneficial bacteria. This study offers new science to look at an old problem. Someday in the not-too-distant future, if you suffer acne, you may be handed a lotion that contains priobiotic bacteria to restore your skin microbiome, instead of a prescription for an antibiotic that disrupts it further. In the meantime, if acne gets you down, see a dermatologist to talk about options that might work for you right now.